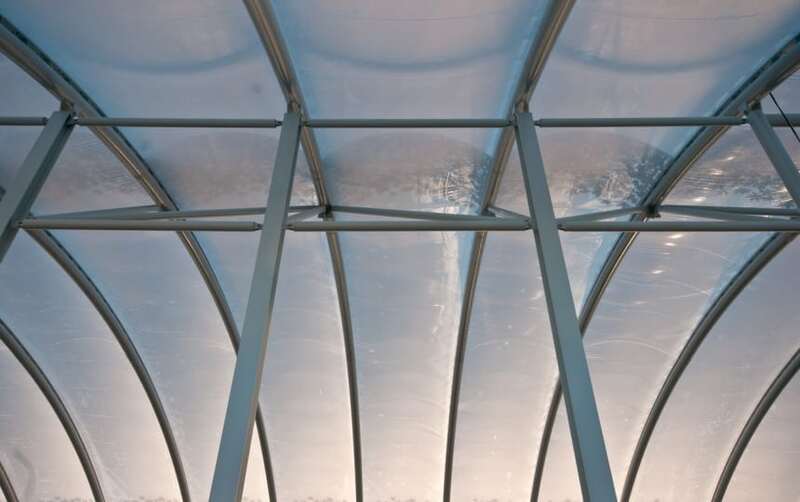 In general terms, we advise that ETFE foil cushions are cleaned externally every 2-3 years if dirt build up becomes a problem. The city environment is dirtier than other locations and therefore may mean that more regular maintenance of the external façade is required. The cushions might also need to be dusted on the underside, although far less often – depending on the amount of dirt collected in the internal atmosphere, we would recommend they are cleaned every 5-10 years but many don’t need cleaning on the underside at any point in their lives! Plenum and associates joints, clamps, brackets and connections, particularly checking for leakage. Providing our maintenance personnel have access to the roof, they will be able to carry out all inspections and maintenance using rope access techniques which adhere to IRATA guidelines. Architen Landrell has a designated Maintenance Department which deals with planned and emergency works at sites across the world. Our maintenance personnel are based at our office in Chepstow and have a fleet of vehicles available for site visits. In the event of an emergency, we also have a 24/7 dedicated telephone line for call outs and advice. For over 30 years, Architen has been at the forefront of the tensile fabric industry. St Georges Park Turns 1! Architen Wins 2nd Place in River Race! Paddling for a Good Cause! Architen Landrell recieves not one but two Awards of Excellence at the 2012 IFAI Awards! Is solar control possible with tensile fabric structures? Ever wished you could print on your building? … You can! Good for the environment and helping City children, win win! Architen summer 2012 newsletter is out! Tensile fabric roof replaced, at 33 years old! How does a structure develop from the design team to being on the factory floor ready to be made? What can we use tensile fabric for? What shapes can tensile fabric create? Architen Landrell Shortlisted for the 2011 Builder & Engineer Awards! Watch us on site at Trinity Walk, Wakefield – ETFE Roof installation! Manufacturing and repair service launched! James shaves the day for Comic Relief! Living and Breathing; Architen Landrell on site for the ‘Big 4’ interactive sculpture! Anyone for the Opera? Architen Landrell win Garsington Opera project! World Cup Victory for Architen Landrell! Brand new range of standard products! Architen Landrell contributes towards RHS Chelsea Flower Show winner! Architen Landrell attains ISO 14001 Accreditation! Green machine: Architen Landrell help build the first eco-phone charger! Architen Landrell wins at the Cardiff Design Awards! Fabric installation at the Venice Beinnale declared a triumph! Prime Minister starts his summer holiday with a trip to an Architen Landrell structure! Recharge and Renew; Architen Landrell helps to promote renewable energy! Architen Landrell gets the Designer look! Architen Landrell wins at the Enfield Design Awards! Employees Celebrate Ten Years at Architen Landrell! Christine wins company Conker Contest! Architen Landrell wins at the IFAI Achievement Awards 2007! Tabard Square wins Housing Development Award! Architen Landrell join Edwin Shirley Staging in catering for some of the greatest names in music! Architen Landrell Wins Best Business Entry at Annual Charity Raft Race! Charity Raft Race for the Architen Landrell Boys! Architen Landrell helps Butlins prepare for the Smoking Ban!